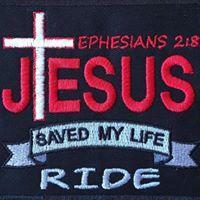 Hosted by The Gathering led by the Spirit the 3rd annual Jesus Saved My Life Ride & Gathering. Fun for the whole family you can pre-register on more...0 the Jesus saved my life Facebook page or at Moses Leather in Grand Junction. Registration is free, donations are welcome. All Proceeds from this event are to benefit Joey Nietzel who has been diagnosed with 4 types of cancer. Kick stands up at 10 am, If you don't ride bring the family to the Lions club park starting at 11am. There will be games for the kids, a silent auction, a raffle and BBQ by the swine doctors and Live entertainment. Come Join us to celebrate Life, Love and JESUS. On August 25th, join RiversEdge West and local river experts for our annual Raft the River trip, a one-day float trip and dinner along the Colorado more...0 River in Fruita, Colorado from 3:00~7:30. We'll be floating from Rimrock Adventures to the Loma Boat Ramp. We typically spend about 1.5-2 hours on the water and make two stops on the riverbank to hear from guest speakers along the way. These short talks from local river experts will give you a behind-the-scenes look at the river restoration happening along the river and may also include discussions about the tamarisk beetle, fish, and wildlife. After spending time on the river you will arrive back to Rimrock Adventures for dinner, live music by Shaun Ray, prizes, and drinks donated by local restaurants such as Cafe Sol, Barons Bar and Grill, and Copper Club Brewing Company. RiversEdge West and Rimrock Adventures take care of everything (guided float, shuttles, raft guides, dinner, drinks, music), all you need to do is show up! The cost is $100 for non-members, $85 for RiversEdge West members. Seats are limited and tickets typically sell out, so be sure to reserve your space in advance! Registration will close on August 10, 2018. 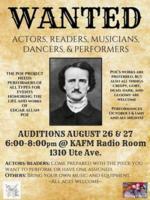 All proceeds go to RiversEdge West's programs that are restoring rivers to a healthier, more vibrant state throughout the West. Community dancing taught and cued by caller with live Celtic/Traditional music. 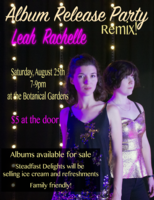 Leah Rachelle is celebrating releasing the remix of her debut album with a family friendly event. Steadfast Delights will be selling ice cream and more...0 refreshments as you listen to the concert. Cool off in our brewery with live music by Collin Reese! SIP AND PAINT YOUR PET'S PORTRAIT! One glass of wine included in ticket price!